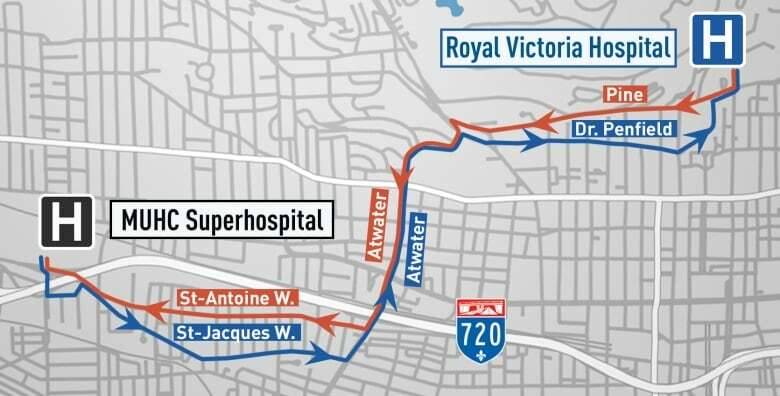 As part of a hospital move billed the "biggest in Canada," 154 patients were transferred Sunday from the historic Royal Victoria facility to Montreal's new MUHC superhospital. Final patient transferred to new site at 12:25 p.m.
As part of a hospital move billed the "biggest in Canada," 154 patients were transferred Sunday from the historic Royal Victoria facility to Montreal's new superhospital. The move to the new McGill University Health Centre (MUHC) Glen site took several hours less than expected and involved fewer patients than originally thought, with some being discharged prior to the switch. "It was just incredibly smooth," said Sheldon Magder, an intensive care unit physician at the MUHC. "There was a lot of pre-planning... really good teamwork and everyone working together." Beginning at 7 a.m., ambulances left the Royal Vic roughly every three minutes to shuttle patients to the MUHC. A baby in neonatal intensive care was the first patient to be transported to the new McGill University Health Centre (MUHC) superhospital. The last patient to be transferred arrived at the new site at 12:25 p.m. The Royal Victoria hospital, an historic 122-year-old facility in downtown Montreal, stopped accepting new emergency room patients at 5 a.m. The new MUHC facility admitted its first patient shortly afterward. The first baby — a healthy boy weighing 3.6 kg —was delivered at the new site at 6:55 a.m., staff confirmed. Greg Clark, an ER doctor, told reporters the new facility had been fully staffed for the past several days in preparation for the move. "We're very excited to have this opportunity to be in this modern hospital," Clark said. The move involved years of planning and presented a host of logistical challenges. Health Care Relocations, an international consulting group which has moved 300 hospitals worldwide, was tasked with the job. The Research Institute of the MUHC (an amalgamation of several MUHC sites) already completed opened its doors in February. Spanning five city blocks, the new hospital has 346 adult care beds, 154 pediatric care beds and more than 8,000 staff. The whole move is expected to cost $10 million. The Black Watch Royal Highland Regiment paid tribute to the Royal Victoria and its years of service. The hospital was built by Scottish immigrants in 1893.